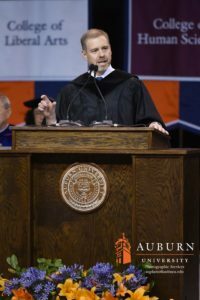 One of the greatest honors of my life was delivering the 2016 Spring Commencement address for Auburn University. The best part was that my niece, Annie, was one of the graduates in attendance that day receiving her masters degree in speech pathology. It was wonderful to experience the whole day together. I knew I was giving the address almost a year in advance. In theory, that was plenty of time to prepare. In reality, I procrastinated. Virtually no one outside of my immediate family knew that I was going to give the address. Looking back on it, I felt real pressure to deliver a meaningful message and just thinking about it or talking about it made the feeling worse. To put things in perspective, I’ve given lots of talks to large audiences in my day and I never get nervous. I’m always excited to address a large group. This was different. A few months before graduation day I was having dinner with friends. One of my dinner companions was my dear friend, Jason Mendelson, who had recently performed the National Anthem to open a Cubs game at Wrigley Field. As Jason talked about his crazy singing experience, I got up the courage to talk about my upcoming speech. Jason’s response was “Wow, that’s a lot of pressure. What are you going to say?”.